Welcome to Just Tyres Braintree. Our Braintree tyre fitting centre supplies and fits budget, mid range and premium tyres quickly, and we’re conveniently located on the Springwood Industrial Estate. Whether you require a unique tread pattern that provides optimum braking, or excellent fuel efficiency, we're confident we can provide you with the most suitable product, and we're regularly updating prices to beat competition. 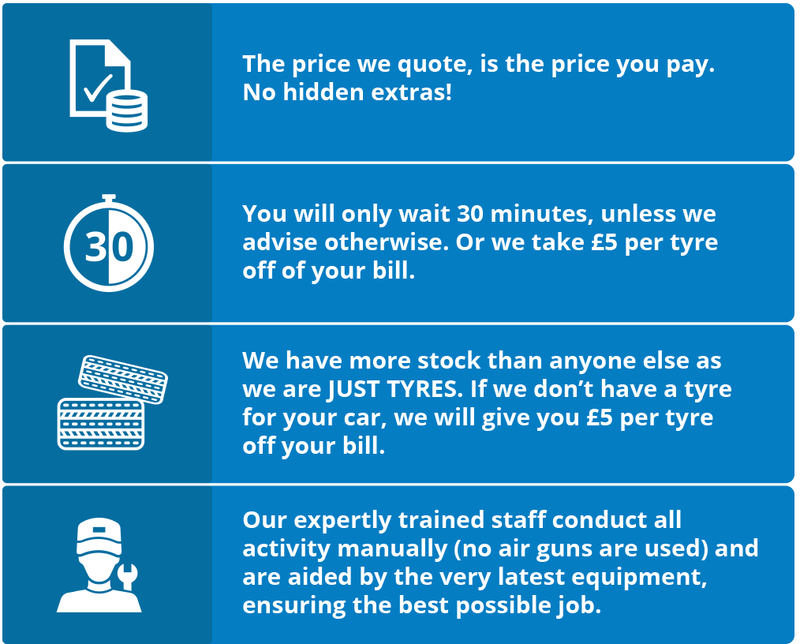 At Just Tyres Braintree, we're confident we can provide you with the right tyre at the lowest possible price, and our lowest price guarantee sees us refund the difference on any tyres you purchased (at a lower price) elsewhere. All we ask is that you produce a current and local advertisement or written quote (within a 20-mile radius) for the item you purchased, but please note that this does not include internet based offers/quotes. Booking your fitting appointment online is easy and you can do this when you checkout online, however, you can simply turn up to our Braintree tyre fitting centre during opening hours if you prefer.